Written and directed by Eric Rohmer, Ma nuit chez Maud (My Night at Maud’s) is the story of a devoted-Catholic engineer who spends the night with a divorced woman as his ideas become challenged. The third film (fourth film in order of its release) as part of Rohmer’s Six Moral Tales follows a man coping with his ideals as he meets a woman with a vivacious personality who challenges his beliefs. Starring Jean-Louis Trintignant, Francoise Fabian, Marie-Christine Barrault, and Antoine Vitez. Ma nuit chez Maud is an evocative and engrossing film from Eric Rohmer. Set during the Christmas holidays at the French town of Clemont-Ferrand, the film follows a devoted-Catholic engineer who is invited by an old friend to a show where they spend the night with a divorced woman that would have implications for this engineer whose beliefs and ideals are questioned. It’s a film that play into a man staying one night at the apartment of this woman where he later copes with its aftermath just as he is smitten with another woman he encounters in the town that he would see in church on Sundays. 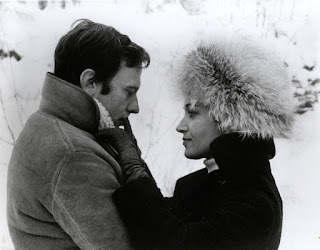 Eric Rohmer’s screenplay has this unique three-act structure where the first act follows the life of its protagonist in Jean-Louis (Jean-Louis Trintignant) as he attends the Sunday service while working as an engineer in this town he’s just arrived in. Upon meeting his old friend in Vidal (Antoine Vitez) who is a university lecturer at the town’s college, Vidal would invite Jean-Louis to attend a concert which would begin the second act that largely takes place at the apartment home of a former lover of Vidal in Maud (Francoise Fabian). In meeting Maud, discussions about the theories of Blaise Pascal where it leads to an argument between Jean-Louis, Vidal, and Maud about these ideas where Vidal leaves to risk driving in the snow with Jean-Louis staying in as he gets to know Maud as a woman who endured heartbreak while revealing her ex-husband had cheated on her some years ago as it’s been a year since she got divorced. The film’s third act isn’t just about Jean-Louis trying to engage into a relationship with Maud but also have the courage to talk with this young blond woman in Francoise (Marie-Christine Barrault) whom he first sees at the Sunday service. Rohmer’s direction is very intimate in its presentation and setting where it is shot on location in Clemont-Ferrand during the Christmas holidays. While there are some wide shots on top of the mountains to get a look into the town as well as characters walking the mountains, much of the film has Rohmer use medium shots and a few close-ups as it mainly play into the interaction between characters. Notably the scene at Maud’s apartment where much of the film’s second act takes place as there’s not a lot of camera movements in the film in favor of straightforward compositions where Rohmer show Jean-Louis, Maud, and Vidal discussing the theories of Pascal as well as the difference between Atheism and Catholicism as Maud and Vidal practice the former. It also play into this air of sexual and romantic tension between Jean-Louis and Maud once Vidal leaves the apartment with Jean-Louis not wanting to give in to temptation yet Maud is sympathetic to his morals as she is also still reeling from her divorce. Still, there is this air of attraction of their opposite views where Jean-Louis would sleep on her bed with her though nothing sexual happens. Rohmer does display that restraint while also showcasing this town that Jean-Louis is new to as there’s some beautiful driving scenes into some of the streets and narrow roads where it’s entrancing as well as the lighting display in some parts of the city. Still, Rohmer uses the city as a character with its winter setting that include the film’s third act where Jean-Louis gets to know Francoise and learn they have a lot in common but she isn’t exactly what she seems to Jean-Louis. Overall, Rohmer crafts an intoxicating yet compelling film about an engineer whose Catholic ideals are challenged upon meeting an Atheist woman who is willing to show him a different world. Cinematographers Nestor Almendros, Emmanuel Machuel, Jean-Claude Gasche, and Philippe Rousselot do amazing work with the film’s black-and-white photography with Almendros doing much of the work in its approach to low-key lighting for the interiors as well as the usage of grey for the scenes in the street and snowy exteriors in the day. Editors Cecile Decugis and Christine Lecouvette do excellent work with the editing as it is largely straightforward in its presentation with a few jump-cuts for a few low-key dramatic moments. Set decorator Nicole Rachline does fantastic work with the look of Maud’s apartment with its stylish decoration which is a direct contrast to the more quaint homes of Jean-Louis and Francoise. The sound work of Jean-Pierre Ruh, Jacques Maumont, and Alain Sempe do superb work with the sound to play up its natural setting in its exterior locations as well as how music sounds at a concert hall. The film’s wonderful cast include a few notable small roles from Marie Becker as Maud’s daughter Marie, Anne Dubot as a date of Vidal in its third act, Guy Leger as the Catholic priest who performs the Sunday sermons, and Leonid Kogan as himself who performs at the concert that Jean-Louis and Vidal attend. Antoine Vitez is fantastic as Vidal as an old friend of Jean-Louis who is fascinated by the ideas of Marxism as he would introduce Jean-Louis to Maud while wanting to challenge Jean-Louis ideals on faith. Marie Christine-Barrault is excellent as Francoise as a biology student that Jean-Louis is smitten with as he would see her at Sunday service where he would later talk to her in the third act thinking she is this ideal women when she’s really far more complex but also shares many of Jean-Louis’ ideals on faith. Francoise Fabian is brilliant as Maud as a divorced single mother who spends much of her time at home dealing with her divorce and her heartbreak while befriending Jean-Louis despite their different views on the world. Finally, there’s Jean-Louis Trintignant in an amazing performance as Jean-Louis as a devoted Catholic engineer who meets Maud one night as he is challenged by her ideals while trying to comprehend his emotions and morals about embarking on a relationship with Maud and his feelings for Francoise. Ma nuit chez Maud is an incredible film from Eric Rohmer. Featuring a great cast, gorgeous photography, an intimate setting, and themes of faith. It’s a film that explores a man whose meeting with a woman with different beliefs raises questions into his own self and temptations while dealing with the fact that he’s smitten by another woman who shares his ideals. In the end, Ma nuit chez Maud is a sensational film from Eric Rohmer. It's been years since I've seen this, but I remember thinking that Jean-Louis Trintignant was just brilliant. I think I saw this shortly after being mesmerized by him in Amour and wanting to see his early work. I need to watch this one again. Great in depth review! I really, really like this one. The chemistry is amazing and I especially love the script. @Drew-Thank you. It was a first-timer for me as I'm now one film away from finishing the Six Moral Tales series as I really enjoyed it so far. @keith71_98-This is definitely a film that I enjoyed though I think Claire's Knee so far is my favorite of the series at this point. You have really sold this movie to me. Great write up. @vinnie harris-Thank you. I hope you check out the entire series as it's worth watching.